Are you looking to be certified in First Aid and CPR? Does WSIB require your employees have their first aid? Are you a new parent and would like to learn some first aid in case of emergency? The Peel Paramedic Association (PPA) through an initial start up grant from the Ontario Trillium Foundation, has been actively involved in your community for many years offering First Aid and CPR demonstrations and certifications! Our goal is to show how simple bystander CPR is and have all citizens trained in Peel Region! The PPA has participated in many outreach events in collaboration with Peel Regional Paramedic Services, The Mikey Network, St. John Ambulance and Mississauga/Brampton Fire Departments. You can find us at different events throughout the region - school visits (preschool to adult), shopping malls, community centres, regional open houses, private events, neighbourhood parties etc. The Peel Paramedic Association offers training and certification for all levels in First Aid and CPR. Our instructors are experienced paramedics with many years teaching various first aid levels. The first aid and CPR (with AED) skills will be taught in a practical, useful and clear manner leaving you feeling confident with your new knowledge! Not interested in being fully certified? Even without certification, a bystander can still help control a scene and perform "compression only" CPR! We offer quick trainings in basic first aid and CPR - no certification needed! Help us take away the fear/stigma related to offering your valuable help in an emergency. Get trained in first aid! If interested in first aid training, having the PPA attend an event or would like to request information please contact info@peelparamedics.ca. The PPA is proud to partner with PRPS Community Relations Officer Brad Bowie and A Platoon Superintendant Jay Szymanski in our first annual Toques for the Homeless campaign. Together we have purchased 300 bright coloured toques. Each response vehicle in the PRPS service will have two toques available to be given to homeless/those in need patients we encounter during our duties. There are no criteria required, other than Paramedics feeling the toques are needed. Replacements will be found at the divisional stations when you run out. Each year, the Peel Paramedic Association teams up with Peel Regional Paramedic Services. Through Paramedic donations at the stations, money raised at our Annual Golf Tournament, donations by various Peel Regional Departments and community corporate sponsors, the PPA has been able to fill ambulances with toys and diapers for Peel Children's Centre, a local charity supporting Peel's families. Starting in 2015, each year we include toys for hospitalized children in the children's wards at our three local hospitals, as well as Tim Horton's gift cards for the children's families. Paramedics and staff of Peel Region Paramedic Services once again supported the Mississauga Food Bank during their 2016 summer food drive. 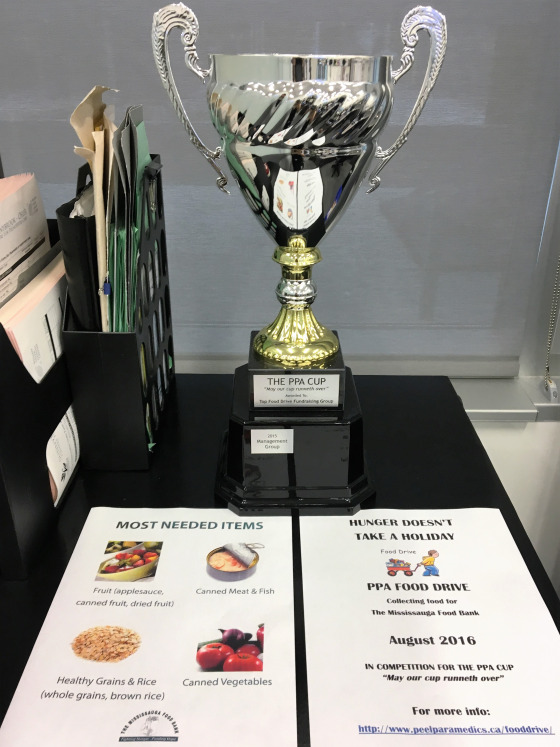 The PPA food drive, "Hunger Doesn't Take a Holiday" saw more than 450lbs of non-perishable food collected throughout the month of August. The event, in its second year, saw the Management Group once again claim the PPA cup "May Our Cup Runneth Over". Thank you to The Award Store of Mississauga who generously donated the PPA Cup. The PPA would like to thank Superintendents Larry Titus and Lawerence Saindon for their support. We would also like to thank Brad Bowie for his assistance with the pick up and delivery of donations. We were proud to be able to donate the food to an organization that partners with more than 40 community agencies throughout Mississauga. We hope to raise even more donations next year. Each year the PPA partners with PRPS in raising funds for both Breast Cancer research (October) and Movember campaign in support of men's health (November). This year we are pleased to offer ribbon pins in support of these great initiatives.